A hot ham and cheese sandwich, covered with a creamy Béchamel sauce, and finished with a fried egg. Simply omit the egg for a Monsieur. I love love love this sandwich and after I posted about having one for a late breakfast/early lunch over on Facebook a few days back, I've had several requests to post the recipe for the cheese sauce I used. There are many variations to this French sandwich that dates back as far as 1910, and apparently started off as a cafe snack. Literally meaning crunch from the French word "croque," the monsieur or mister version is usually served with a Béchamel sauce and the madame with an egg atop, so named it is said because the egg resembles a woman's hat. Very often the sandwich is buttered and grilled in a pan, prepared much like a grilled cheese, but I followed a recipe from Jennifer Chandler's book, Simply Suppers, that called for broiling the sandwich instead, and it was simply marvelous. Variations aside, Croque Monsieur or Madame, is basically a hot ham and cheese sandwich and somewhat reminiscent of a Kentucky Hot Brown to me. The addition of a spicy mustard gives it a wonderful kick and for mine, I used Colman's mustard, a very spicy British mustard, that was perfect for this blend of flavors. Not at all a difficult sandwich to make and worth the effort, the trick is coordinating the making of the cheese sauce, with the use of the broiler, with the frying of some eggs, especially when you are making more than one of these at a time. It's nice if you have a helping hand to cook the eggs while you're doing the rest. The original recipe calls for Gruyère cheese, but I'm more apt to have Swiss on hand than Gruyère so I made that substitution since they are somewhat similar cheeses. 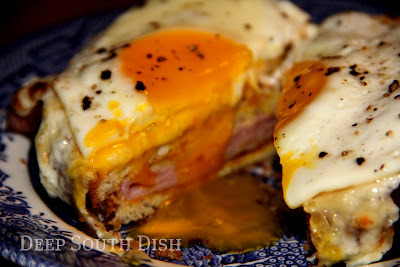 To make this a Croque Monsieur, simply omit the eggs, though I highly recommend adding them. Just delicious. Preheat broiler. Meanwhile make a very light roux by melting the butter and stirring in the flour, cooking only about a minute. Whisk in the half and half slowly until fully incorporated, and continue whisking until mixture begins to thicken. Remove from burner and grate in nutmeg, adding the Parmesan and 1/4 cup of the Swiss cheese. Stir until cheese is blended in, add salt and pepper and hold over very low heat, stirring occasionally. Add a splash of half and half if needed to loosen. Meanwhile, toast the bread under the broiler on both sides, leaving the oven door ajar. Warm the ham in the microwave. Spread a thin layer of mustard to one side of four slices of toast and top each piece with two slices of ham. Sprinkle each sandwich with about 1/8 cup of the Swiss cheese. Place open faced, under the broiler, with the oven door ajar, just until cheese is melted. Remove sandwiches and top with the remaining toast. Pour the cheese sauce evenly over the top of each sandwich. If sauce has thickened, stir in just a bit of half and half to loosen first. Divide the remaining Swiss cheese and sprinkle over the top of each sandwich. Place under the broiler, with the door ajar, just until cheese has melted and begins to lightly brown. Top with a fried egg and serve immediately. I used Colman's mustard, a super spicy English mustard, which was fantastic with this sandwich, but any spicy mustard will do. 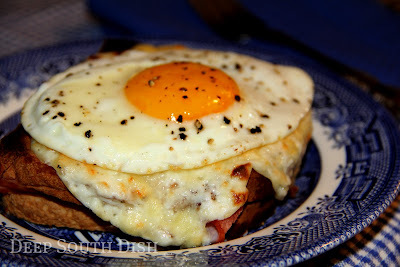 Variation: To make this a Croque Monsieur, eliminate the egg. Can also substitute Gruyère cheese for the Swiss. Turn them into Monte Cristo style Croque Monsieur sandwiches by dipping them in a batter made of 3 whisked eggs and about 2/3 cup of milk. Dip and pan fry over medium like a grilled cheese, until golden brown on both sides. 13 HUNGRY PEOPLE COMMENTED. ADD YOURS! What time is breakfast in the morning? I'll be there. I've never heard of this, but it looks delicious. Hearty enough for Hubs too! Mmm mmm mmmmmm! This sounds like the perfect "I want breakfast for dinner" dinner. I'm already hungry and this is making my tummy growl! Not too shabby, I'd say! Yummers! Oh you have inspired me to do this one night for breakfast night. We have it once a month when I do breakfast for dinner. I love this sandwich and it reminds me of growing up and my grandmother feeding them to us after a hot day in the sun playing and eating blackberries! Yeah! I'm not a fan of ham and cheese, but wow, that looks terrific! That just sounds outstanding and the fried egg on top is must :-). 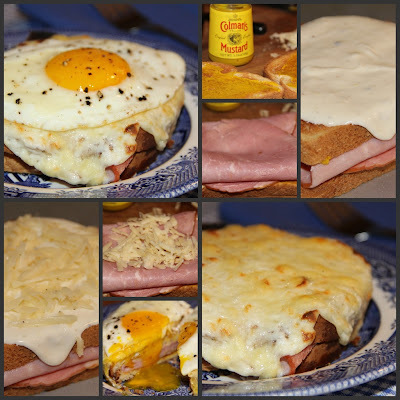 I adore a croque madame but never think to mak eit at home. I can;t imagine why I don't, yours looks amazing! I've made the Madame a few times. It's one of my top 5 favorite sandwiches along with the Monte Cristo and yeah, the Hot Brown. Absolutely Bev! I just used what was in the pantry, but I do love sourdough.